A double blow is heading Scotland’s way if the country votes for independence, according to Scottish Labour’s deputy leader. In an article in the Independent last Monday, Anas Sarwar writes that by voting to leave the UK, Scotland will be handing over control of its monetary policy to a rump UK that would be dominated by Tory governments. Sarwar’s logic is that if Scotland becomes independent and continues to share Sterling it will be a foreign government in London controlling our monetary policy. These arguments may have some relevance for those of us on the Left, but is there any truth that Scottish independence will doom the working class in the remaining UK to years of Tory rule? The only way to tell is by looking at what the election results would look like with and without Scottish MPs. 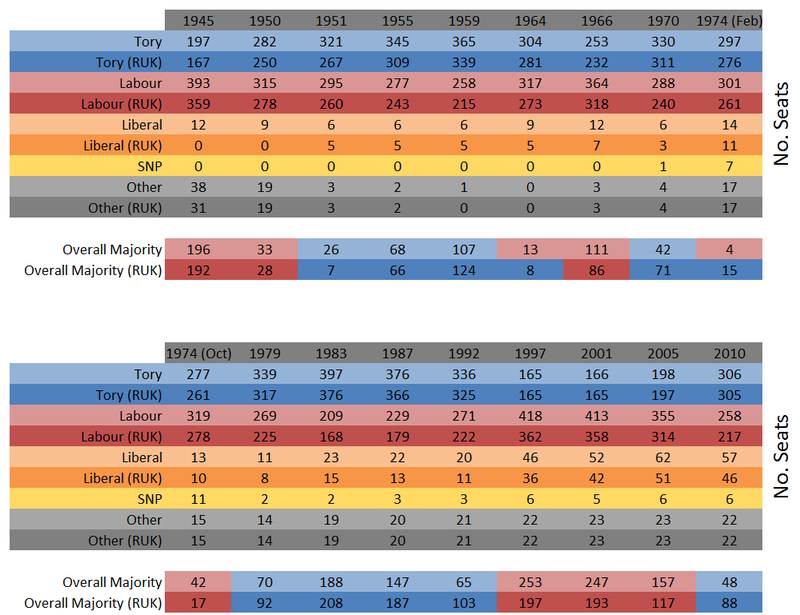 The following is a breakdown of all seats won in the House of Commons from the 1945 election assigned to each party. The light shade colours indicate results that include Scottish constituencies, while the dark shades indicate what the results would look like if all Scottish constituencies were excluded from the figures (i.e. rest-of-UK – RUK). Note the term ‘overall majority’ refers to the difference in seats between the largest party and the next largest party, whilst the term ‘absolute majority’ refers to any party that wins greater than 50% of the seats available. Hence, it is possible for a party to gain an overall majority against the main opposition without securing an absolute majority of seats in Parliament. This was the case in the 2010 election when the Conservatives won an overall majority against Labour but required a coalition with the Liberal Democrats to secure an absolute majority. The graphs and tables below are what the overall majority each winning party achieved in reality (light shades) and how that would change when the Scottish constituencies are removed (dark shades). The results are not quite the cementation of Tory rule alluded to by Labour et al. 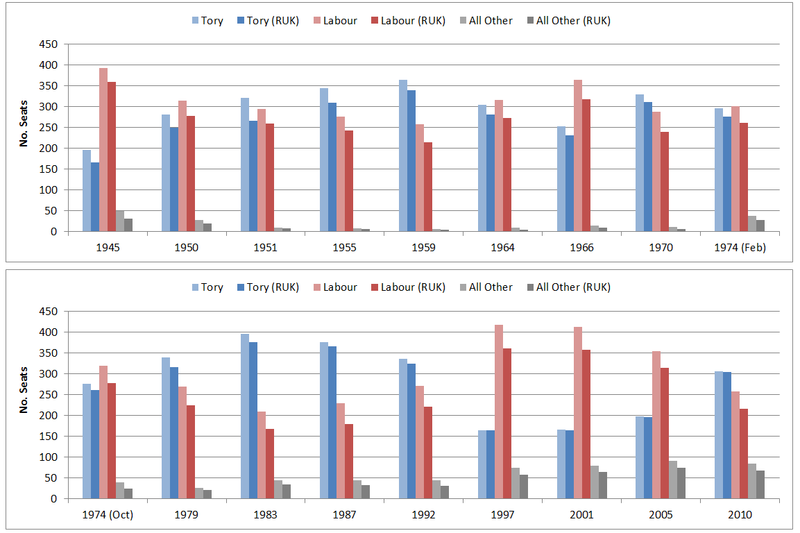 Out of the 18 general elections since 1945 only two would have resulted in a Labour win being turned into a Tory win. One in 1964 where a Labour overall majority of 13 would be replaced with a Conservative overall majority of eight, and again in February 1974 where Labour’s four seat lead would be replaced with a 15 seat lead for the Conservatives. None of the results which brought Thatcher, Major or Blair to power would have changed significantly enough to alter the outcome of the largest parties of those elections. Of the two elections which would have changed in outcome from Labour to Tory the first is the 1964 election. Here, the Labour party won an overall majority of just five seats more than the Tories after three consecutive Conservative election victories. This gave the party a tiny absolute majority in the Commons of just four seats. The Labour leader and Prime Minister, Harold Wilson, would later successfully call an early election two years later to attempt to secure a larger parliamentary majority. 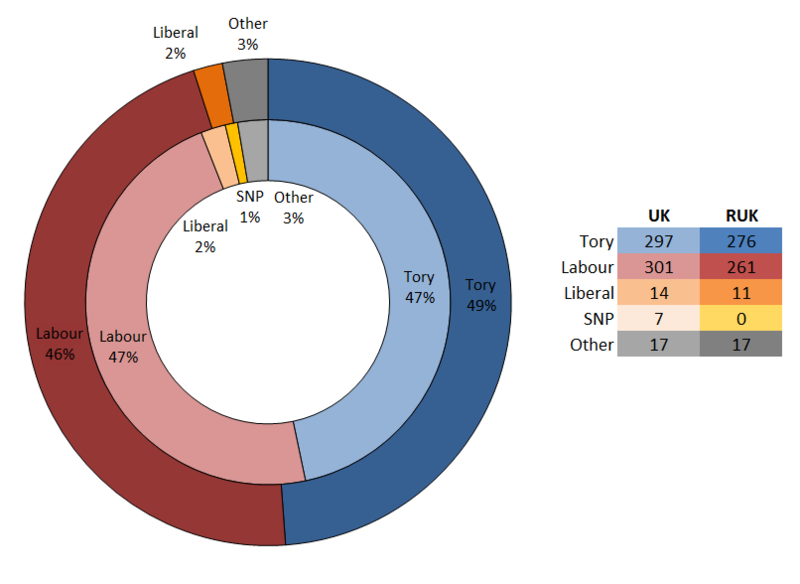 Taking all Scottish constituencies out of the original results (44 Labour MPs, 23 Conservative, and four Liberal) alters the outcome to give the Tories an overall majority of eight over Labour. However, they would have only been able to form an absolute majority in the Commons by a single seat as 280 marks the 50% point without Scottish seats. It is likely that any Conservative government would not have lasted a full term given the fragility of their parliamentary position. Even a coalition with the then Liberal party would only gain them an additional five seats. The chart above shows the original all-UK results in the inner ring (light shaded colours) with the altered results with Scottish constituencies removed (RUK) in the outer ring (dark colours). The second result altering a Labour to Conservative win would have been the February 1974 election. Here the sitting Conservative government of Edward Heath was defeated by Labour’s Harold Wilson who was to become Prime Minister again after 10 years since winning his first victory. Labour won 301 seats, an overall majority of four; however they failed to secure an absolute majority by 17 seats, resulting in a hung parliament with Wilson forming a minority government. Recalculating the results without Scottish constituencies, removing 40 Labour, 21 Tory, seven SNP, and three Liberal MPs, would have given the Conservatives an overall majority of 15 over Labour. Without the Scottish seats they would have needed 282 MPs to achieve an absolute majority – however with only 276 rest-of-UK seats they would have been six short. The February 1974 election marked the first significant entry of the Scottish National Party into Westminster politics, gaining a further six seats to their first one won in the previous election. 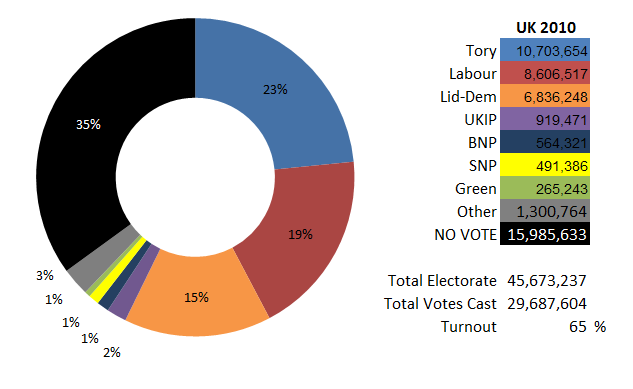 Hypothetical 2010 election – an absolute Tory majority of nine seats. The last result worth looking at is the most recent general election in the UK from 2010. Here the Conservatives won an overall majority of 48 over Labour, but remained 20 seats away from the 50% mark of an absolute majority. Rather than opt for a minority administration as previous post-war governments have, the Conservatives entered into a coalition with the Liberal Democrats who secured 57 seats. This gave the Conservative-Liberal Democrat (aka ‘Con-Dem’) coalition an overall majority of 105 over Labour and an absolute majority of 37 in the Commons. Though the removal of Scottish seats from the election neither results in a change from Tory to Labour or vice-versa, it would in this instance result in the minority Conservatives securing an absolute majority rather than a hung parliament. By deducing the 41 Labour, 11 Lib-Dem, six SNP and single Tory MPs the Conservatives would hold 305 seats in a 591 seat parliament – 88 over Labour and an overall majority of nine (51% of seats in a hypothetical rest-of-UK parliament). It is difficult to say whether in this situation the Tories would have again entered into coalition with the Liberal Democrats. But given the vehemently right-wing agenda of the real Con-Dems it is likely that coalition or no coalition the Tories are just as intent on smashing the welfare state and worker’s rights. It is highly doubtful in this hypothetical situation that the Tories would not experience huge fragility with such a slim majority. If the Lib-Dems had chosen to oppose Tory rule rather than capitulate it is likely that any Tory government in this scenario would face a greater chance of defeat. The above three hypothetical scenarios demonstrate how any results may have significantly changed by removing Scottish constituencies from UK general election results. There are other scenarios where absolute majorities have been reduced to hung parliaments for both Labour and the Conservatives but from looking at the numbers it is clear that the difference in seats is so minimal that it is impossible to say that the outcomes of UK elections would change substantially in any way. Although it is possible to say that without non-Conservative Scottish MPs Labour would have lost elections to the Tories, this in actual fact has only happened on two occasions. The above figures give lie to the claim that Scottish independence will saddle England and the rest of the UK with generations of Tory rule. Not only would the Tories continue to struggle to form governments in a rest-of-UK parliament, a Labour party could be forced to re-engage with its working class roots and constituents. A more radical Labour party in ‘RUK’ would need to offer meaningful policies to people to secure votes if it is to replace its Scottish seats that it has for so long taken for granted. Far from ensuring that the Tories are kept out of government, Scottish Labour MPs are responsible for entrenching neoliberal ideology in Britain. Safe in the knowledge that Scotland will continuously elect Labour MPs to Westminster at each general election the party is free to move rightwards to capture ‘the centre ground’ and win business backing. This results in one of two things occuring: the election of a neoliberal ‘New Labour’ party by an electorate desperate to keep the Tories out, or as happened in 2010, a collapse in the Labour vote as its traditional backers are alienated from a pro-business agenda giving the Tories a win by default in our deeply flawed first-past-the-post electoral system. Consider the last chart above which shows the results from the 2010 UK general election. The single largest category is those electors who chose not cast a vote at all. With a turnout of 65%, this means that just under 16 million people abstained. Almost the entire population who voted for Labour and the Liberal Democrats combined. The best way to keep the Tories out of government in both the UK and a possible Britain without Scotland is by tapping into this vast pool of potential supporters who see no answers with Labour or the Left as it stands – not by chasing the ever allusive ‘centre-ground’ and not by relying on Labour’s usual crop of Scottish MPs. Momentum before the election. If a party looks like it’s going to be the winner, it’s much more likely it will be. Without the Union, observers would always be writing off Labour’s chances. The answer to this would be to find some less inept ‘observers’ – ones who know what they’re talking about. Considering the rise of UKIP, I doubt very much if ANY party will be capable of forming a government on its own without going into coalition with another…..with OR without Scotland. The black section clearly shows many people couldnt give a fig about voting. Of course, this means they’ve got no rights to complain when the winning government ruins their lives, but that’s people for you. In any case, party politics may well disappear in a few short years, since Tory members are resigning in droves to join UKIP and formerly staunch Labour supporters are now realising that NuLabour couldn’t give tuppence about the working class. They’re all sick to death of career politicians, the money trough, the Brussels trough, expenses fiddling and little Hitlers banging on about essential forced EU integration against the people’s will. Expect the unexpected and that includes an English come-back. Scotland will only leave England to years of Tory rule, in the same way that Scotland will leave the citizens of Nebraska to years of Republican rule. i.e. Scotland will have absolutely NO bearing on how the US electorate, or that in England, will vote in the future. 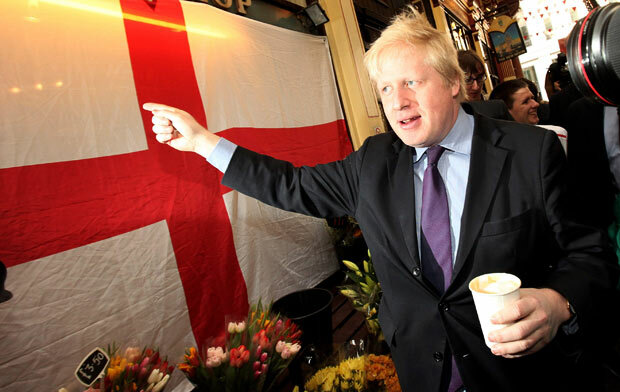 If England returns a Tory government in the future, it will only be because a majority of the English electorate, those who could be bothered to vote, decided that they wanted a Tory government. However, Scotland might lead by example – and show the good people of England that another way of life that is socially responsible, is actually possible. I’m a Scot living in Scotland but I’ll be moving to London before the referendum, so won’t get a vote. I believe in the union but if independence means no more UK Labour governments then yes please! If there is any usefulness to this exercise then we should look to how the past shows the way to the future. Most of the above results are not representative of the future as the Tories no longer have any MP’s in Scotland so the loss of 40 Labour MPs will have a much bigger impact than previously. 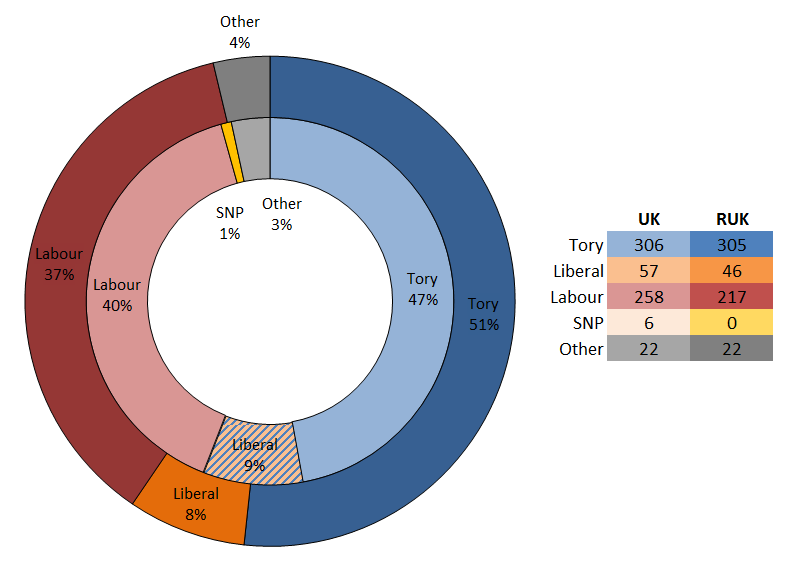 In 2010 if Scotland was independent Rump UK would have 305 Tories and 217 Labour MP’s. This is the likely scenario for the future not any of the previous situations. The break up of the UK would have a knock on effect on Wales and Northern Ireland. The troubles would probably flare up again and Wales would very likely break away. This would not just slightly hamper Labour but severely effects its vote. Once Wales and Scotland are gone the Labour party would be finished. Some may of course want this but the likely winners in this scenario is the English Tory Party. This analysis is wrong. You are talking about ‘majority’ when you’re referring to the gap between the largest parties. When you look at the actual MAJORITIES there would have been at least 4 periods of labour governments that would have been conservative instead. AND… the affect would have been to favour conservatives so both in 1960s, 1970s and 1990s conservatives may not have lost power to labour given that they would either have stayed in power (instead of handing over) or the size of their majorities would have been larger meaning that we would have seen more aggressively conservative governments (1980s, 1990s). Most pertinently in 2010 the conservatives would have had a clear majority so there would not have been a coalition and the tories could have pursued their manifesto unabated. All in all the post-war period would have been dominated by the conservatives and by radical conservative policies, with only a few interludes of Labour government. The distinction between overall and absolute majorities is defined at the start of the article. I’d be interested to know what 4 Labour governments would be Conservative as you mention. What elections specifically? What a strange perspective to take on elections. The facts are that there are two occasions when Scottish voters actually made a difference to the outcome of the election. Scotland generally votes Labour, but only gets a Labour government when enough English voters feel the same. On other words, being in the union has consigned Scotland to generations of Tory government. Scots get whatever government England wants. Whatever political persuasion you are, assuming that you believe in democracy it cannot be right that there are 52 MPs representing Scottish constituencies who have an influence on what happens to those of us who live in England. Scottish legislation is increasingly determined in Edinburgh – and rightly so. An example of the unfairness of this relates to University tuition fees. How can Danny Alexander, Gordon Brown, Alistair Darling, David Steel, Menzies Campbell, etc etc vote in favour of tuition fees when they are only voting in favour of students domiciled in England paying fees. Meanwhile their own constituents (and everybody else in Europe by the way except the English) get free tuition funded in the main by English taxpayers ? Unfair and undemocratic. Let’s hope there’s a big Yes vote and we can all go back to self determination. If you’re actually worried about representative government in England, maybe fix the electoral system so it’s proportional. Arghhh! once again this England, Uk, Britain semantics mix up. It sort of summarizes why I’d vote for Welsh independence in a heartbeat. Sorry guys, you want us to stay in the UK so that we can thole Trident and the House of Lords longer? The only way that we can start getting rid of them from these islands is by getting them out of Scotland ASAP making it easier for the rUK to fight them.